Iasis Medical began its association with Ethiopia back in 2006.Dr Daragh Fahey who was an Iasis trustee at the time had visited an ‘eye camp’ in Tigray province with Dr Fitsum Bekele. 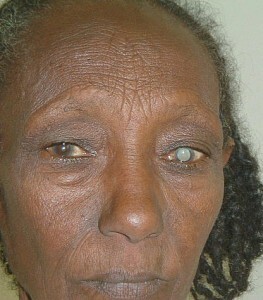 There are about eighty ophthalmologists in Ethiopia.Only a handful base their practice outside Addis Ababa. 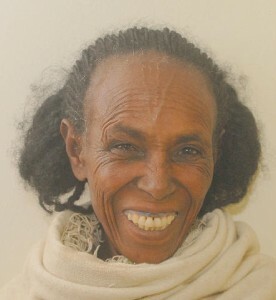 Dr Fitsum Bekele is based in Mekelle the principal city in Tigray. Fitsum has committed his career to making an impact on blindness in Ethiopia and in particular his home province of Tigray. The number of people requiring cataract surgery and other sight saving treatments far exceeds the capacity of the local ophthalmic services. 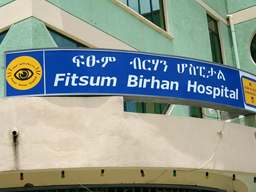 Iasis has become an established supporter of Dr Fitsum’s work at the Fitsum Birhan Hospital. The hospital is at the hub of the eye services within the Tigray region – open and accessible to all. Regardless of age, poverty, gender, ethnicity or geographical location. In partnership with Fitsum and together with other non-governmental organisations working in the area, we want to build the unit so that it becomes a self sufficient centre of excellence for eye services. Dame Anita Roddick of The Body Shop UK met Dr Fitsum shortly before her death in 2007. She had the great foresight to support Iasis Medical in their work with Dr Fitsum . The Roddick Foundation were very generous with financial support at that time. 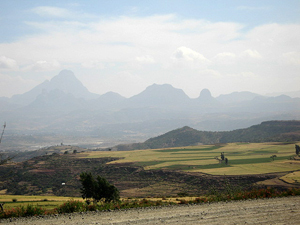 As a result of this, many hundreds of poor people in Tigray have had their vision restored. There have been several milestones in Iasis Medical’s journey in Ethiopia. As Christmas approached in 2009 we decided with Dr Fitsum to buy a thirty seat coach for the cataract programme. This would be used to bring patients into Mekelle and to take the surgical team and equipment out to a distant location, to do a satellite operating event. We raised £18,000 here in Britain for the bus. The chassis and engine were from Isuzu. The body was added in Addis. By Christmas 2010 the bus was ready for its maiden voyage. We now know, that in its first three years the bus has been responsible for over 5000 cataracts. In 2011 with great help from Tonbridge Rotary and an International Rotary award.We were able to buy a vitrectomy machine for the Fitsum Birhan Hospital. The highly specialized piece of equipment from Geuder in Germany is used for aspirating blood clot in the body of an eye and used in urgent situations to save vision. In October 2012 Mrs Georgina Davidson and a team of thirty girls from a charity in the States called Team One Vision came to Britain to run the Beachy Head Marathon. They raised nearly fourteen thousand dollars. An enormous help for Dr Fitsum’s cataract project. Many organisations and individuals have been extremely supportive of our work in Ethiopia. Iasis Medical is extremely grateful to many people – most recently The Roddick Foundation, The Paragon Trust, the estate of Kathleen Townsend,the estate of Jenny Hannington, Hellingly Church, Tonbridge Rotary,Lewes Rotary,Hailsham Rotary plus many other individual families and organisations. November 2012. Harvest time in northern Ethiopia. The terraced fields look white , bleached by the sun. The low mountains look as though they have bandages along them. The whole family harvests. The children walk the donkeys round in stone ringed circles to tread out the grain. The teenagers toss the straw in the air. Mum,dad and granny oversee everything. The scene is straight from the New Testament. It was no different. The donkeys,the camels the grinding of corn. Through the heart of the harvesting area was an Iasis eye trip to a small mountain village called Adishoo. It is sixty miles south of Mekelle eye hospital. The population had been told in advance that an eye team was coming. Five hundred people sat outside the gate of a very basic health clinic. They had walked fifty kilometers to be seen. They filed slowly into the clinic many with sticks, the blind ,the lame,the children. Examining them took all day. They sat patiently. A little boy sat with granny. He was holding a very lean chicken. He wanted one birr less than a pound. His granny was selling a stretched goat skin. I was told to a merchant. A merchant brings up the image of a gentleman with a large money bag. I didn’t see him. As they sat there all day in the sun, the flies were a nuicance, they used fir twigs and horse hair fly whisks. A man was reading the New Testament in Amharic – the Ethiopian alphabet. His little book was precious it had been dropped in the fire,It was burnt. Very slowly the simple things were treated. Bits of straw in the eye, allergies, infections. 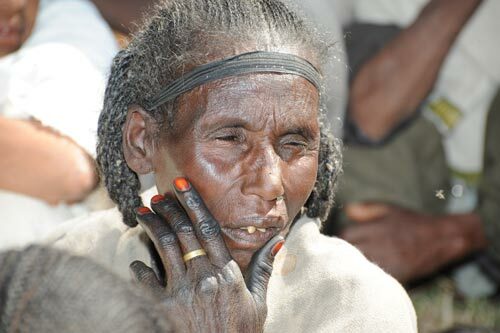 Sixty patients were chosen for surgery mostly cataracts. One man needed to have his eye removed A baby with urgent congenital cataracts, to stop blindness. Some patients sadly could not be helped. 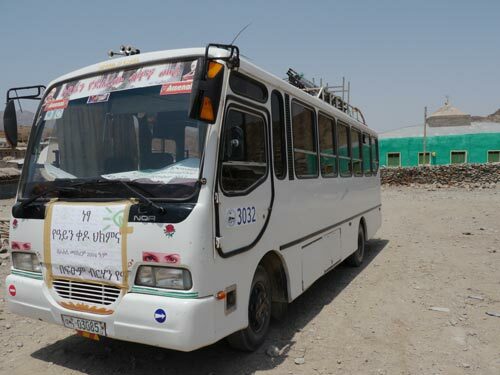 The sixty lucky ones were taken to Mekelle. They were given six small bread rolls. They had this food with water for the next forty eight hours. Over the next two to three days they all had their operations. I filmed a man who had gone blind in his only functioning eye, three years before. He staggered and fell up some steps. He squeezed a one birr note into a young boy’s hand, because he needed guiding, he was completely blind. Two days later after his cataract was removed I asked Fitsum the eye surgeon, if I could speak to him. He stared at Fitsum and I. he didn’t know who I was, but he knew Iasis was something to do with the process. He stared at us and said ‘ you have given me the sun’. Ethiopia, situated in the Horn of Africa, is the third-most populous nation in Africa. It’s heralded as the cradle of humanity since its human history dates back almost five million years. Ethiopia is also the only country in Africa that was never colonized and therefore is unique in its history of continuous sovereignty. Traditionally, Ethiopia’s economy was based on subsistence agriculture, with an aristocracy that consumed the surplus. For a number of reasons, the peasants lacked the incentive to improve production or to store the excess harvest, and so they existed from harvest to harvest, vulnerable to crop failures. Despite the extensive modernization of Ethiopia over the last century, the overwhelming majority of its 90 million population are still peasants who continue to live in the same way.